Tip: If you have more than two players, break into teams and change team each round. ...while the Second Player is not listening! The Second Player listens to the recorded a cappella in REVERSE and tries to guess the song at once. If the Second Player can’t guess it, then he tries to repeat the reversed version by recording it fragment by fragment. Tip: You should play your recorded fragment right after the recording to make sure it sounds good. If you are not satisfied, you can re-record it right away, before you continue! When all fragments are recorded, Second Player listens to them all together reversed back and makes his final guess! Before playing with your friends try to play a few rounds by yourself. It will be easier to explain game rules later. It is always easier to show how the game works than to explain it. At first it might sound almost impossible to repeat a reversed fragment. But you just need to make a similar sounding "noise"; you will be amazed when you hear it reversed back! Stick to popular and well-known songs, otherwise it might be impossible for the other player to guess. Alternatively you can simply hum a song. It will be much much easier to repeat and to guess. Hold your iPhone upside down, that way the microphone will be at the top for more convenient recording. Press and hold the rec button to record. The recording will stop the moment you release the button. Make sure you have no long pauses or noises at both ends of your fragments. Check application settings to adjust recording limits and fragments length and to disable hints. If you have external speakers or a microphone you can use them for better sound quality. Change the interface language of your iPhone or iPad to see more familiar songs in the suggestions box. You can play one vs one or one vs all or team vs team. Team members can play against each other for the total number of rounds won or against other teams. If you play team vs team, it might be a good idea for your teammates to make sure the player from the other team is not listening when you make your initial recording. Always improvise! You can come up with your own game rules and share them with everyone at http://inreverse.me. Our new song splitting algorithm checks for pauses in recording, but it's not perfect. If you don't want to have words split in middle try to make clearer pauses while singing. One second is now minimal fragment size you can choose in settings. But with such short fragment size a lot of words will be cut in the middle. Optimal size for fragment length is 2 or 3 seconds. You can also choose maximum total number of fragments per song in settings (6-18). Too many fragments and your game rounds will become too long. 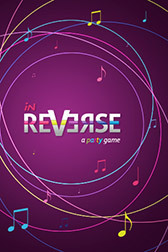 Record videos of your parties with inReverse and send them to us (contact form on http://inreverse.me)! We will publish the most interesting ones on the website!